Snacks will be available beginning at 3:15 pm. Discussions will cover the science behind sea level rise and the current conditions, future projections, and impacts in North Carolina. 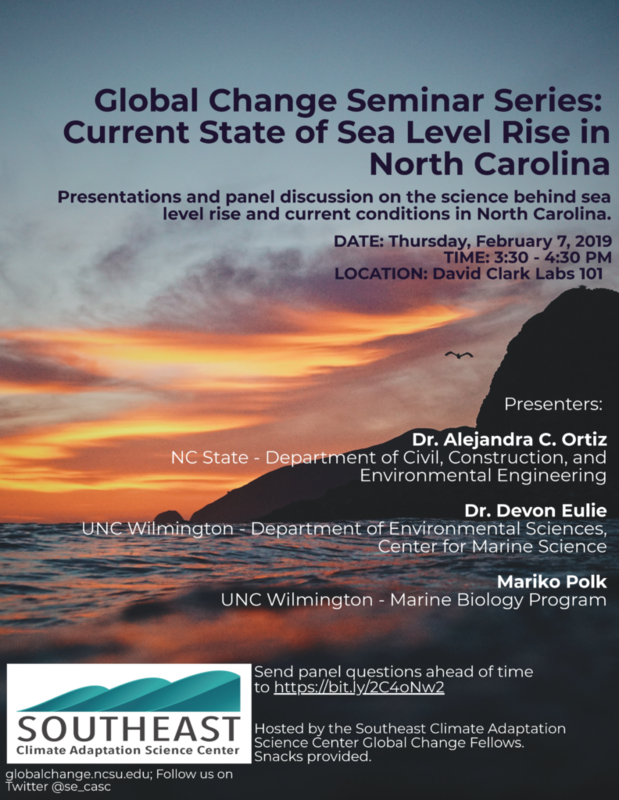 Researchers, Dr. Alejandro Ortiz, Dr. Devon Eulie, and Mariko Polk will provide 10-minute presentations on what causes sea level rise, current and future conditions of sea level rise in North Carolina, and impacts to different ecosystems in North Carolina, followed by an open discussion with the audience. This seminar is sponsored by the Southeast Climate Adaptation Science Center (SE CASC) and hosted by the SE CASC Global Change Fellows. It is the first of three seminars covering Sea Level Rise Impacts, Human Stories, and Adaptation in North Carolina. You can join in person or via Zoom, https://ncsu.zoom.us/j/260273738 (more details below).